New Haven, Conn. – Researchers have pieced together the three-dimensional skull of an iconic, toothed bird that represents a pivotal moment in the transition from dinosaurs to modern-day birds. Ichthyornis dispar holds a key position in the evolutionary trail that leads from dinosaurian species to today's avians. It lived nearly 100 million years ago in North America, looked something like a toothy seabird, and drew the attention of such famous naturalists as Yale's O.C. Marsh (who first named and described it) and Charles Darwin. "Right under our noses this whole time was an amazing, transitional bird," said Yale paleontologist Bhart-Anjan Bhullar, principal investigator of a study published in the journal Nature. "It has a modern-looking brain along with a remarkably dinosaurian jaw muscle configuration." "The first beak was a horn-covered pincer tip at the end of the jaw," said Bhullar, who is an assistant professor and assistant curator in geology and geophysics. "The remainder of the jaw was filled with teeth. At its origin, the beak was a precision grasping mechanism that served as a surrogate hand as the hands transformed into wings." "The fossil record provides our only direct evidence of the evolutionary transformations that have given rise to modern forms," said Field. 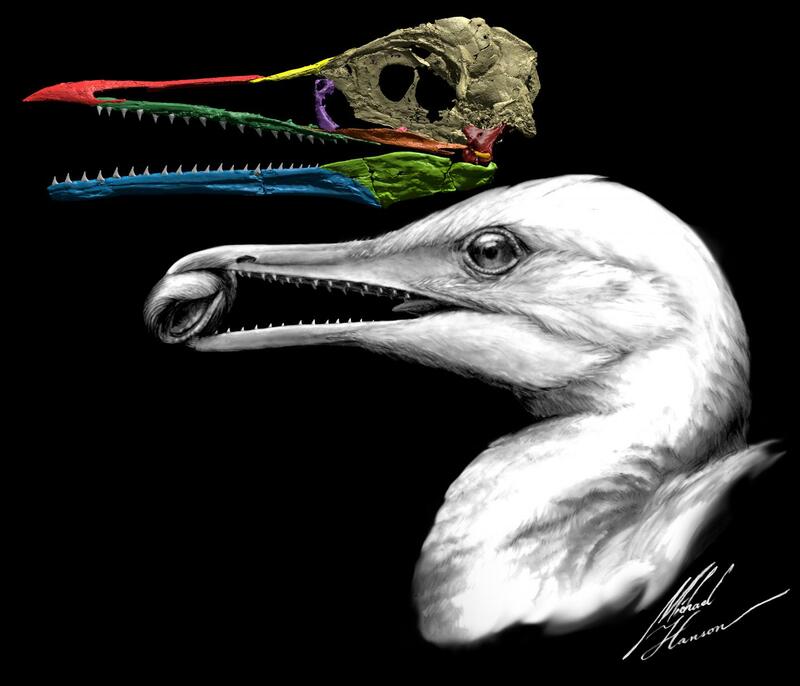 "This extraordinary new specimen reveals the surprisingly late retention of dinosaur-like features in the skull of Ichthyornis — one of the closest-known relatives of modern birds from the Age of Reptiles." The researchers said their findings offer new insight into how modern birds' skulls eventually formed. Along with its transitional beak, Ichthyornis dispar had a brain similar to modern birds but a temporal region of the skull that was strikingly like that of a dinosaur — indicating that during the evolution of birds, the brain transformed first while the remainder of the skull remained more primitive and dinosaur-like. "Ichthyornis would have looked very similar to today's seabirds, probably very much like a gull or tern," said Hanson. "The teeth probably would not have been visible unless the mouth was open but covered with some sort of lip-like, extra-oral tissue." In recent years Bhullar's lab has produced a large body of research on various aspects of vertebrate skulls, often zeroing in on the origins of the avian beak. "Each new discovery has reinforced our previous conclusions. The skull of Ichthyornis even substantiates our molecular finding that the beak and palate are patterned by the same genes," Bhullar said. "The story of the evolution of birds, the most species-rich group of vertebrates on land, is one of the most important in all of history. It is, after all, still the age of dinosaurs."